I am SO excited to be sharing a new-to-me Canadian indie brand with you today. 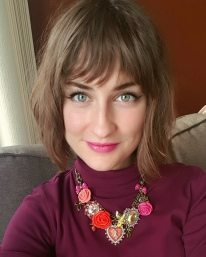 My Indie Polish is created locally (in Toronto) by Tanya who has released the most amazing trio of neon cremes just in time for festival season! The Neon Festival Trio includes Field Party, Neon Green and Neon Coral and I will also be reviewing My Indie Polish's new 7mL mini bottle. Field Party is an amazing Robin's Egg blue crelly with super fun neon glitters including magenta/purple stars which I'm now obsessed with. For a crelly, the formula on Field Party is excellent! I am wearing 3 thin coats because thinner coats are the way to go to ensure that all the layers of glitter show though. The glitters came out of the bottle easily onto the brush with no fishing. I did a little glitter placement with one of the stars but that's it! I finished off with top coat for a glossy and smooth finish. Neon Coral is tied for my favorite from the trio with Field Party. If you are still lemming after the original China Glaze Flip Flop Fantasy... YOU NEED THIS POLISH! I would say that this is really close but with a MUCH better formula. It's a neon creme and I used only two coats and top coat. I loved how shiny and glossy this polish is with just a little top coat. So perfect for summer. I love how neon it is! 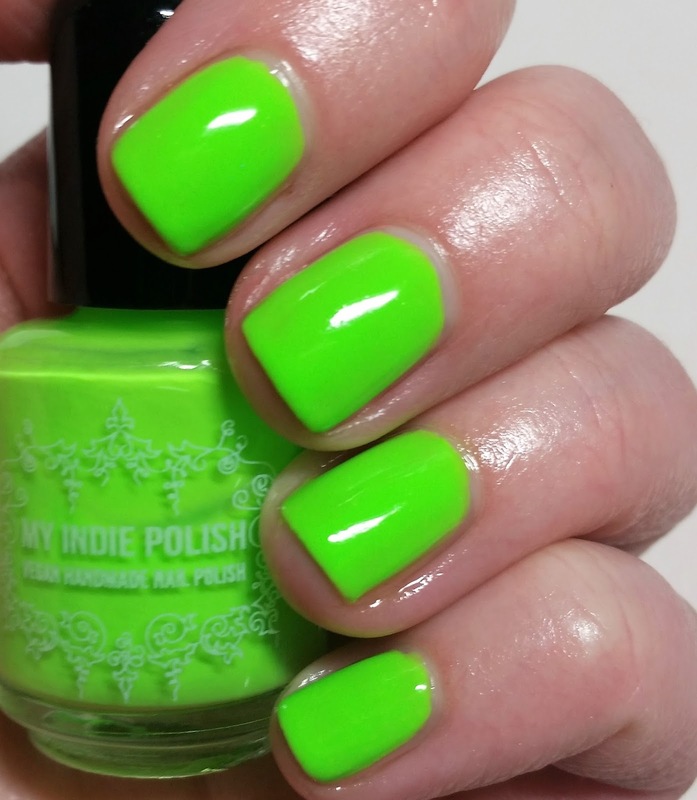 Lastly, this is Neon Green which is a lovely creme that is BRIGHT, BRIGHT, BRIGHT! I used three coats plus top coat and it's almost perfect but I will be more careful with my application next time. I wore this for about 5 days with NO TIP WEAR and only a little chip on my thumb. I was so impressed with the formula and wear of this polish. Nice work, Tanya! I have nothing but high praise for this trio and the new 7mL mini bottles! I am a bit of a snob and only ever buy full-size bottles but I was happily surprised by these minis. The bottle size is larger than the usual 5mL which means MORE POLISH. The brush is also great! I found it easy to use and not much different than a 15mL bottle. If you are looking to save money, these minis are great!! You can purchase the 7mL mini or 15mL full size set from My Inide Polish.